"Rama! The ministers then crowned Amsumanta, after consulting the will of the people. He ruled over the kingdom without the slightest error or fault, for he was strong in morality and spiritual excellence. The people were fostered as if they were children born from his own loins. When old age crept on him, he offered the throne to Dileepa, his son, and proceeded to the Himalayas for the ascetic disciplines he wanted to impose on himself. His aim was not only self-realisation; he sought to bring down the Ganga for the sake of the salvation of the departed uncles. But, he too had to give up his body without fulfilling the desire. "Dileepa was also moved by the same wish for, he knew how deeply his father and grandfather had longed for the consummation, bringing the Ganga down on earth! He tried various means. He performed many abstruse yajnas on the advice of sages. Pangs of sorrow that he could not fulfill the family ideal invaded him and he became chronically ill. Seeing that physical strength and mental stamina were declining, he placed his son Bhagiratha on the throne; he entrusted to him the mission that was beyond his grasp, namely, bringing the Ganga down. Soon after, Dileepa too left the earth. "Bhagiratha had the Vision of the One with the brilliance of a thousand Suns. He fell prostrate, overwhelmed with gratitude and devotion. He prayed, Lord! Cause the Celestial Ganga to flow on earth, so that my great-grandfathers might be saved from perdition, and be restored to Heaven. And, favour me with children so that the Ikshvaku Royal Line might not be rendered extinct, with me as its last representative. May the dynasty continue and flourish. He held fast the Feet of the Lord and submitted his supplication. "The Lord replied, Son ! The first of your wishes is very hard to fulfill. Nevertheless, I shall grant you that one. The boon for the royal line? Yes. You will have a noble son and your dynasty will continue and flourish. Arise!' At this, Bhagiratha rose and the Lord continued, Bhagiratha! Ganga is swollen and swift; when it falls from heaven, the earth will not be able to bear the impact. So, as Ruler of the Earth, you have to ponder over the problem and discover means by which dire disaster can be avoided. When the Ganga descends upon the earth, the effect will be calamitous. So, the river must be made to fall first on the head of Siva; from there, the waters may be led on to earth with lessened impact. This is the best course, from the point of view of the inhabitants of the earth. Consider this well.' After saying this, the Lord withdrew. "It flowed along the route that Bhagiratha took and all along the route, men benefitted from the sacred stream and sanctified themselves. They were released from the effects of the sins, by the cleansing influence of the celestial Ganga. The great-grandfathers too were redeemed by the performance of obsequies on the bank of the thrice-holy stream, and with its waters. "Since Bhagiratha brought the Ganga to earth, the river got the name, Bhagirathi! After the ceremonies for the manes were over, Bhagiratha returned to Ayodhya. Happy that he could fulfill through Divine Grace the keenest wishes of his father and grandfather, he ruled over the empire for many years receiving the spontaneous homage of his contented subjects. At last, he too left the body." When Viswamitra narrated the story of Ramas fore-fathers thus, Rama and Lakshmana were all attention; they were enraptured with the incidents. But, the Sage said it was already midnight and they could all go to bed and sleep. So, they prostrated before the Preceptor and laid themselves on the thick sands of the river itself. Rama and Lakshmana could not sleep; they reclined on the sands, only in obedience to the order of their preceptor, not because they needed rest! They lay picturing to themselves the wonderful story of the descent of Ganga from heaven to earth, till they found that morning had arrived! There they performed the ablutions and morning rituals in the river and prepared soon for the journey ahead. As soon as some teenage disciples announced that the ferryboat was ready, all moved towards it and took their seats and crossed the holy river. They reached the northern bank and started on the further stages of their journey, admiring the heartening forest-scenery through which they passed. When they had covered some distance, they came upon a vast city full of beautiful buildings. Rama turned to Viswamitra, and asked him, "Master! We are seeing from here in this exquisite forest a vast City. To what kingdom does it belong?" The sage replied, "Rama! It appears to be near, but, in fact, it will take quite some time for us to reach it! Perhaps, we may arrive there in the evening hours. I shall tell you the story of that City's origin and fortunes when we actually reach it. Meanwhile, let us proceed". Rama heard these words which the sage spoke with a twinkle in the eye and a smile on the lips; he grasped the meaning of his directive and walked on without a word in reply. When they descended into the valley there was no sign of any City or human habitation; but, on rising to the heights, the City could be seen very near! Moving forward like this, they found that though evening drew near they could not reach the City. As Viswamitra had already indicated the City was still far away! As evening fell they halted; and after bath, they performed the evening rituals as laid down in the Sastras. While resting, Rama returned to the question he had already asked. "Master! will you kindly tell us about the City ?" At this, Viswamitra said, "Rama ! I too was just now thinking about that matter! Though I know that you are aware of the working of every mind, still, the veil of Maya (taking the appearance as real) hides the fact and precipitates men into misleading tracks. All cannot be masters of the mind. When persons like me find it impossible to keep it under control, there is no need to dilate on the fate of ordinary men! The very moment the thought flashed in my mind that you had forgotten to ask about the story of the City, you questioned me about it! No further proof is wanted to show that you are the All-knowing! "Rama! In ancient times, Kasyapa had two wives, Aditi and Diti. The sons of Diti were repositories of physical might and the sons of Aditi, of moral grandeur. They grew up mightier and mightier with each passing day. The parents derived great joy, watching them grow up so fair and fast. "One day, the sons of both Diti and Aditi gathered together and entered into a discussion on means of avoiding old age. Finally, they came to the conclusion that the Amrith or Nectar that can be secured by churning the Ocean of Milk will prevent the physical calamities of disease, senility, and death. Soon, they set about that task. 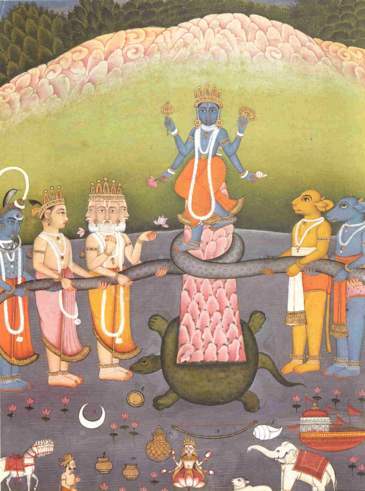 The Mandara Peak was plucked and placed in the Ocean as the Churning Rod; the serpent Vasuki was chosen as the rope, to be wound round the rod so that the rope might rotate quick and fast. While the churning continued for a long time, the serpent Vasuki began vomitting its poison. It was enraged so much as a result of the pain that its fangs struck against the rocks of the mountain peak. The poison fume raged as a huge fire! "Seeing this, the sons of Diti and Aditi became mortally afraid; they felt they would be burnt into ashes in that holocaust! They prayed for succour to the Lord. When Lord Vishnu appeared before them, the sons of Diti pleaded pathetically, Lord! Save us! Put an end to this dread disaster and the Lord changed into Siva and said, Dear Ones! I am the eldest of the Gods and so, I am entitled to receive the first fruit of this churning process' Declaring thus, He drank off without delay the Halahala poison that was causing the panic. "Thereafter, the sons of Diti and Aditi continued the churning of the Ocean. Another calamity threatened them now; the Mandara Peak started sinking! So, they prayed again to the Lord Vishnu. He appeared again and assured them, Darling children! Do not become frightened. The Lord assumed the Form of a Tortoise, and getting underneath the mountain peak raised it on His back and kept it safe on the hard shell so long as the churning lasted. The sons of Kasyapa were immensely grateful and happy. They extolled the Lord in profusion. "From out of the Ocean of Milk, there emerged a God with a Danda (Stick) and Kamandalu Waterpot in His Hands! His name was Dhanvantari. Even as the sons of Diti and Aditi were looking at Him, there emerged again from the Ocean thick sweet juice or Rasa, which got rolled into a ball, which, in turn, soon swelled and broke, disclosing a bevy of maidens. Since they were born of Rasa, they are named, Apsaras. They tried in many ways to persuade the sons of Diti and Aditi to wed them; they prayed and petitioned; but all their efforts were of no avail; so, they lived without being wedded, free and fickle. Then, from out of the waves rose the daughter of the water-god, Varuni and she had a chalice full of intoxicating liquor. The sons of Diti refused to have anything to do with the liquor! The sons of Aditi quaffed it. Those who did not accept the Sura (liquor) were known as Asuras, and those who accepted it, as Suras. "At last, from that Ocean of Milk arose the Amrith (Nectar). Who were to drink the Amrith? There arose a huge conflict between the sons of Diti and Aditi. In the terrible fight that ensued, the sons of Aditi began destroying the sons of Diti. The battle threatened to become a battle of extinction. The earth shook under the thrust and counter-thrust of weaponry in that battle. Fear and anxiety spread their dark clouds over the world. Suddenly, Vishnu appeared before the contending parties as an entrancingly charming damsel, who captivated the hearts of all and led their minds away from the combat into which they had plunged! She charmed everyone and during her appearance, the precious Amrith disappeared! The sons of Diti had all died. The grief of the mother was beyond consolation. Kasyapa failed to bring her to the state of normalcy. His attempts to teach her the evanescence of things failed to convince her. She wailed aloud and lamented most excruciatingly as if the end of the world had come. "At last Diti brought herself round; she approached Kasyapa and submerging her agony deep into her mind, she said, Lord! Is this just? We both had children by you. Now I have been made childless. Is this fair? Am I to grieve eternally thus? Not even one of my sons is alive. Rather than have many short-lived sons, one long living one is most desirable, isn't it? When she wept aloud in this manner, Kasyapa consoled her and told her to enter on Thapas (the discipline of austerities to propitiate the Gods) so that she might have a son who will live long. He advised her to give up her grief which could never fulfill her desire. Encouraged by him and seeking his blessings she left immediately and started Thapas, with the professed aim of securing the boon from the Gods, of a son who will be able to defeat the Lord of Gods, Indra Himself! "Kasyapa told her, 'Thapas is no easy discipline. One has to be pure until the very end; one has to observe the vows and fasts, without the least infringement; then only will the Gods be pleased and grant the boon. "Diti reached the region known as Kusaplava and entered upon rigorous asceticism. Knowing her resolve, Indra desired to test her and came to her in the guise of her attendant. Diti's prayer was answered; she became pregnant with child through Divine Grace. Days passed, months rolled by, Indra was beside her, as attendant! One day, in the hot hours of noon, overcome by sleep, she lay on the bed with her hair loose and her head placed where the feet were usually placed. This was against the strict rules of ceremonial purity, which she had to observe with tenacity. So, Indra got his chance; He noted that her posture was heterodox and contrary to Sastraic injunctions. So He punished her, by fragmenting the foetus in her womb. The fragments started weeping inside the womb for their limbs and segments which had broken away; the attendant, Indra spoke softly to them, 'Maa ruda' 'Don't weep'! Diti had terrible bouts of bleeding, she lamented her fate and wept most pitiably. [See Srîmad Bhâgavatam, C6:18-62] "Indra stood before her with folded palms and pleaded, Mother; pardon me. You acted contrary to the rules of ceremonial purity and so, broke the vow. Your hair was unbound and loose; and your head was on the bed where the feet are normally kept. When you slept thus, your Thapas was defiled; when the enemy who is waiting for a chance to foil your fortune gets such an opportunity, will he keep quiet? I am Indra come in this form. You prayed for a son who would kill me, didnt you? The foetus in the womb was to destroy me and so I took that chance to foil my foe. And I did not destroy him through condemnable tactics. You know that strict observance of the vow was essential for the success of your plan; you had to ensure that you did not violate the code. The foetus has been cut into seven fragments and I have spoken 'Maa ruda to them. So, they will be born as the seven Godly Maruthas, (Wind Gods); I am conferring on you this boon', Indra said thus and returned to Heaven. "Rama! This is the place where Indra and Diti had this dialogue and this compromise. Here, Ikshvaku had a son, by Alamba Devi, who was named Visala. This kingdom is called Visala after him. Visala begot Hemachandra, the mighty. He begot Subhadra, and he had as son, Doomraswa, whose son was called Srnjaya; Srnjaya's son was Sahadeva. "Sahadeva was very rich and prosperous; he was a strong pillar of morality and righteousness; he was a valiant ruler of the kindom for a very long period. His son Somadatta had Kakustha born to him; Sumathi was the son of that heroic monarch. He too was a very upright virtuous ruler; in purity and holiness he was equal to the Gods. Rama! This day, we shall enter this Visala City and sleep there; we shall reach the city of Emperor Janaka tomorrow." When they heard these words all were happy. The news of the arrival of Viswamitra was communicated to Sumathi by messengers and he rushed forward to the Sage, with a retinue of courtiers, ministers, scholars and priests, praying that he should enter the City and sanctify the Royal palace by his stay. Viswamitra was pleased with his humility and reverence. He inquired sweetly about his health and happiness, as well as about his kingdom. They were engaged in conversation for some time on the affairs of the kingdom and dynasty when Sumathis eyes fell on the brothers, Rama and Lakshmana. He was so enchanted by their charm and dignity that he asked Viswamitra, who these lion cubs were. Viswamitra replied, "Sumathi! That is a long story, I have no time now to tell you. I shall relate to you the whole story on reaching your place." He then directed the monks and ascetics who had accompanied him, as well as the two brothers, Rama and Lakshmana, to proceed to the City of Visala; he too rose and walked, Sumathi talking with him all the while on matters pertaining to the kingdom. On their reaching the City gate, music from many voices and instruments rent the air; Brahmins recited hymns of welcome and good wishes from the scriptures. After partaking of the Reception feast arranged by the King of Visala, Viswamitra described to the gathering of royal kinsmen, priests and pundits, his own Siddhasram and the Yajna that he had celebrated therein, as well as the heroic way in which Rama and Lakshmana stood guard, to defend the sacrificial precincts from marauding demons. All those who listened to the skill and courage of the princes were struck with wonder and boundless Ananda. They looked on them with admiration, and felt that they are Nara-Narayana come again They prostrated before them, overcome by feelings of reverence. Since it was already late, Rama and Lakshmana fell at the feet of Viswamitra and, taking his permission, they went over to the house that was specially set apart for their rest. Even before dawn, they rose, went through the morning ablutions, performed the matinal rites, and came to their Preceptor, in good time to proceed on the next stage of the journey. They expressed gratitude to King Sumathi, and moved on towards Mithila. Sumathi accompanied them for some distance and then took leave of the sage and others. Viswamitra walked on with his disciples and the Princes; by noon they reached an expansive park. It appeared as if it could boast of a number of hermitages inside it years ago, but now the dwellings had crumbled. One could see also altars once maintained with loving attention, and spots where the sacred fire was once lit and fed. Rama noted that it was a place sanctified by ascetics and sages and he drew the attention of Viswamitra to his surmise. Viswamitra smiled, and said, "Rama! How correctly you have observed! I am very glad. I shall inform you why the great personage who resided in this place left it and went away. Listen! "Even the gods used to acclaim this Hermitage. This is the hermitage of Gauthama Maharshi. For many years, he resided here with his wife, Ahalya. He gladly under-went the most severe austerities. He did many elaborate Yajnas. This park was resplendent with spiritual grandeur; it was bright and full of peace and joy. Every day was a holy day for the people here. Ahalya, the wife of the sage, was a woman of great virtue, and a perfect paragon of beauty. There was no one equal to her in personal beauty and charm; so, Gauthama was keeping her ever under watch, and guarding her with vigilant care. One day, while Gauthama was absent at the asram, Indra, the chief of the Gods, came into the hermitage in the guise of Gauthama himself! The virtuous spouse took Him to be her Lord; she served him reverentially but, the real Gauthama entered and, discovered her apparent faithlessness. He recognised Indra, in spite of his disguise, and became terribly enraged. 'Evil-minded fellow he shouted; but Indra had suddenly disappeared. "He turned towards Ahalya in his anger and roared, You have vowed to destroy this hermitage by indulging in vice, is it? I shall not be here a minute longer. I cannot tolerate the sight of your face. Be prostrate behind some bush, living as a sprite on air, with no food or drink. I am off. Gauthama hated the place that had been desecrated by deceit. "Ahalya wept her heart out, and pleaded that she was innocent of sin, that she was deceived by the disguise and activated by reverence towards her lord only, that she was carried away by the duty of loyalty to her husband. She held his feet and prayed for pardon. Gauthama melted a little at her importunities; the truth became clear to him; but since words once spoken could not be withdrawn, he said, Ahalya! you know that I have vowed never to go against the spoken word. Therefore, you have to lie in bush and briar, sad and starving, until Rama, son of Dasaratha, comes this way and seeing you, He will shower Grace on you, allowing you to touch His Feet, and He will speak with you in great compassion; the Darsan, Sparsan and Sambarshan will cleanse you, and you will shine forth in your real form and charm. I shall then rejoin you. So saying, Gauthama left this place and hastened to the Himalayan region. From that moment, Ahalya lost her name and form; she lives on air, and is deeply lost in austerity, eager to rejoin her lord. And, this once lovely park suffered neglect." tell me where." As Rama moved on, Viswamitra and Lakshmana followed him at some distance. He passed through some tangled bushes and entered a hut, behind a bush of briar. Ahalya was until that moment immersed in austerity; she was far away from the eyes of Gods, demons and men; she had forgotten her Name and lost her Form; she had no concern with food and sleep; she was merely existing as a piece of rock! She appeared like the orb of the Moon, well hidden by clouds, or the sacrificial fire, covered by thick curtains of smoke! As Rama neared her, his foot touched Ahalya. Ahalya raised her head and seeing the Divinely charming Form of Rama, she held the Feet, exclaiming in ecstasy, "Ah! I am saved" "0 God, come to save me from sin! Your heart is moved at last". She poured out her gratitude in many hymns of praise. She rose, like the moon from behind the clouds, effulgent and fresh. At that moment Gauthama too who was a master of the mysteries of yoga, appeared before them for he knew that Rama had come, and rescued his wife. He accepted her, purified by rigorous austerity, and blessed by Rama. Both husband and wife fell at the Feet of Rama and Lakshmana, who were both overwhelmed by the Ananda they had. Gauthama offered reverence and homage to Viswamitra. The band of disciples was amazed at the wonder they had witnessed; they looked on at the brothers with the fixed gaze of wonder. Viswamitra took leave of Gauthama, and walked on, in the north-easterly direction, with Rama and Lakshmana by his side. They neared a City, by evening. The sage pointed to the City from a distance saying, "That is Mithila, that vast concourse of magnificent buildings !" At this, the Brothers as well as the disciples of the sage jumped with joy; they could not contain their happiness. From that spot, they walked faster. Forgetful of physical exhaustion, they quickly reached the main entrance of the City. Wherever they turned, they saw ascetics and Brahmins engaged in the recitation of the Vedas. They saw many houses where sacrificial fires were fed with ritual offerings. Under every tree, sheltering in its shade, were groups of people around the bullock carts which had brought them from the countryside. There were men and women, old and young, with children belonging to all castes and professions, persons from all stages of life assembled at every corner; it was like moving in a stream of joy. The City was packed with eager people moving crisscross on all the roads. The sage and his followers reached the embankment of a tank which was comparatively less crowded; for, they had to decide where they were to stay, and they were not yet quite sure where. The time for evening ablutions had drawn near and, so, they kept their belongings on the bank, took their bath and finished the rites prescribed. 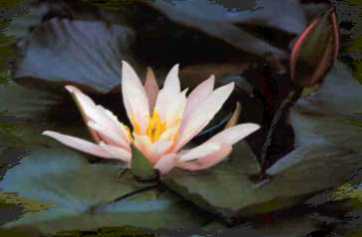 Since the Yajna was imminent, courtiers and warriors from the palace were moving among the monks that were arriving every hour, trying to find out their names, the Gurus and hermitages to which they were affiliated, their spiritual status, and whether they had been specially invited for the occasion. Emperor Janaka was insisting that all such information was to be communicated to him without delay. Meanwhile, Viswamitra had finished his ablutions and rites; he sat on the embankment with his disciples and the Brothers, who looked like twin stars fallen upon the Earth from Heaven. He was describing to them the glories of Mithila. Meanwhile, a courier from the court approached them very politely and enquired, "Master! Please tell me who you are. Where have you come from? We are messengers from the King. We are only obeying orders and carrying out our duty. If you tell us your name, we can inform the King of your arrival." When the messenger hurried straight to the Palace and told the Emperor Janaka that the Sage Viswamitra had arrived, he made arrangements appropriate for the reception of the great Sage and sent the chief Brahmins, Priests and Pundits of the Court under their leader, Sathananda, to where Viswamitra was. The group from the palace approached the embankment, reciting Vedic hymns of welcome and good wishes, and Viswamitra realised that they were coming to take them to the Emperors Presence. He directed Rama and Lakshmana to prepare themselves for proceeding with him. Every one made himself ready. Meanwhile, Sathananda honoured Viswamitra in true Vedic tradition, as befitted a great Master. He fell at his feet; he offered refreshments consecrated with Vedic formulae and announced with exemplary humility that he had come with others, under orders from the Emperor to accord him and all those who were with him, the most sincere welcome. They left a palanquin at the place to bring the bags and baggage of the party and took the Sage and others into the City preceded by bands of musicians, playing on their instruments. As soon as they entered the Royal Road, Emperor Janaka himself moved towards them accompanied by Ministers and courtiers and his nearest kinsmen. Janaka fell prostrate before Viswamitra saying, "Lord! I have realised today my greatest ambition. Mathila has acquired, with your arrival, a unique splendour." He then enquired about the welfare of the Sage, his pupils and disciples. His eyes fell on the two boys, Rama and Lakshmana. They struck him as embodiments of solar effulgence. He could not find words for a few seconds. He knew not where he was at the time. With great effort, he recovered enough awareness of the surroundings to ask Viswamitra "Master! who are these? They strike me as the twin Gods, the Aswinidevas. It looks as if they have just come down from Heaven in order to confer Grace on me. They have the tender Divine charm of those Gods. Or, perhaps, they are the Sun and the Moon come upon the Earth. How did these juvenile embodiments of beauty happen to come, walking the distance as members of the group led by you? Or, did they develop acquaintance with you near here and come with you?" Janaka was pouring out one query after another, as if he was talking to himself, forgetful where he was or what he really wanted to know. Viswamitra saw his plight and could not restrain his smile. He said, "These are the sons of Emperor Dasaratha of Ayodhya. Their names are Rama and Lakshmana. The valour and skill of these boys are amazing and miraculous". The sage desired to say much more, but, he thought it better to tell him all about them, after reaching the place where they were to stay. So, they walked on towards the quarters set apart for Viswamitra and his entourage.